“My assignment was to review only three from the 20-odd small press publications sent to me, but before signing off, let me recommend a small blue booklet titled The Skin by Geraldine Green, from Flarestack Publishing in Birmingham. "The Beloit Poetry, one of America's most venerable, famously reads submissions aloud. If they read Geraldine Green's poems aloud they will think inevitably of e e cummings' regard for punctuation as impediment. “It has all I want in a book with its careful attention to language, heart, and soul. I was overwhelmed by the book's introduction. How intimately and personally it was written. As if it were written for the world of people, never mind their ethnicity or culture or life experience. I read it to begin the book, but also again when I finished it. It touches the beauty of what human discovery entails, the absorption of knowledge and ideas and truths. As for the poems, there are so many that are memorable. But just to name a few, "The echo-sounder." I looked for him last June/ found only green shoots/growing like music through stone. "Cave of the Honey-Bee, Cave of Arachne." When she woke/ dawn was spreading pink-gold fingers/ across the sky. And "Doors" what an adventure that sings of mystery and seeking and then the finding. English poet Dr Geraldine Green is a native of Ulverston UK and writer in residence at Swarthmoor Hall. She has four poetry collections, The Skin 2003 and Passio, 2006, (Flarestack Pubs. Ed. Charles Johnson); and The Other Side of the Bridge 2012 (Indigo Dreams, Ronnie Goodyear). Poems of a Mole Catcher’s Daughter, under pseudonym Katie A Coyle, was published in 2009 by Palores Publications, Ed. Les Merton. 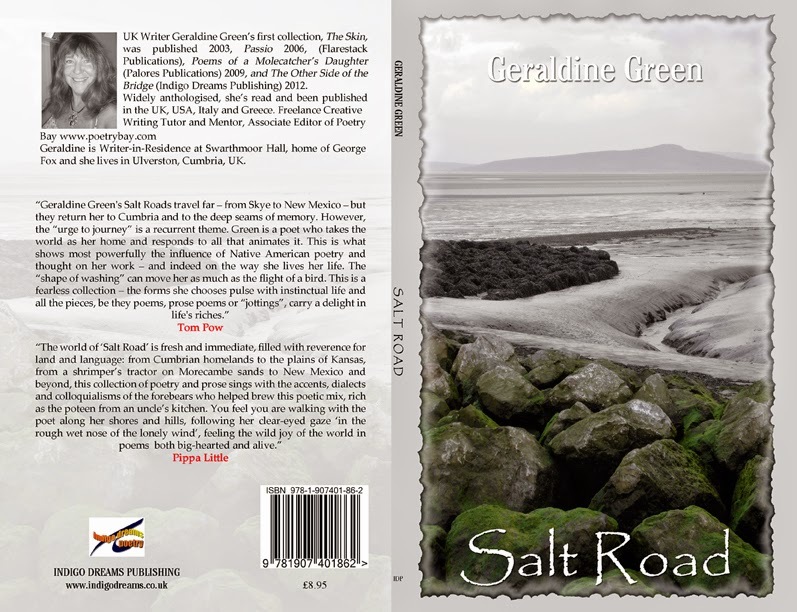 Her fifth collection, Salt Road (Indigo Dreams), is scheduled for release in 2013. Her work has been widely anthologised and appears in poetry magazines in the UK, USA and Italy, including Orbis, Tears in the Fence, Envoi, Smoke, Seventh Quarry, Poetry Cornwall, Citizen 32, Rain Dog, Obsessed with Pipework, Hortus Conclusus, Primal Sanities – A Tribute to Walt Whitman (Allbook Books), On a Bat’s Wing (Five Leaves Press), Simply Connect (Cinnamon Press). She’s read widely in the UK and North America from Scotland to Cornwall and New Hampshire to New Mexico, also Italy and Greece, including: The Dylan Thomas Centre, Swansea, Woody Guthrie Festival Okemah, Oklahoma, Walt Whitman Birthplace Long Island, Laurel Bookstore, Oakland California, the International Women’s Arts Festival, Kendal, CatStrand Dumfries & Galloway, Bowery Poetry Club New York City, Poetry on the Lake, Orta Italy, Skiathos Rooftop Celebration and the Wordsworth Trust, Grasmere. Workshop exercises are included in: Writing Works, A Resource Handbook for Therapeutic Writing Workshops & Activities Jessica Kingsley Pubs. 2006. You can read more about the Write on the Farm workshops on my previous blogs, as well as on Christine Cochrane's blog 'Harping On'. I'm delighted that Christine will be co-tutoring a poetry and harp session with me at the farm in February 2017.